Choosing the country and venue for your dream Destination Wedding is always a challenge. You’ve committed to making your wedding day that much more exotic by travelling for it, and so the whole world has suddenly become your oyster – and with 195 countries out there, the choice can seem a little overwhelming! However, narrowing down your options via the theme and style of wedding you want – from a beach ceremony to a stately manor wedding – is the first step in making this decision. So if you’re sat at home knowing you want to get married somewhere hot, then have we got the inspiration for you! 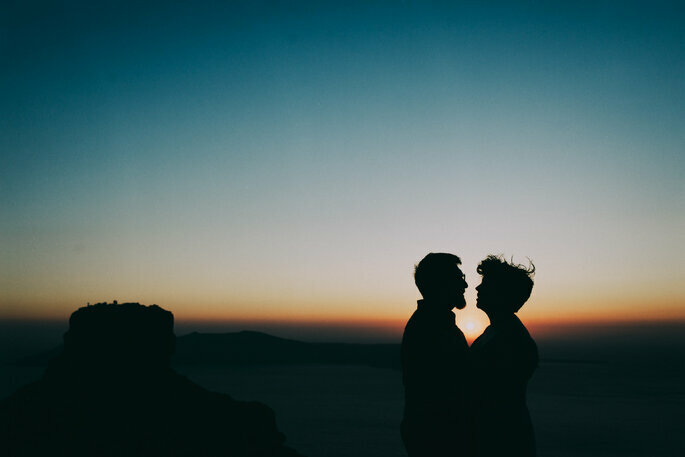 Read on and discover our top 10 exotic destinations for your wedding abroad in 2019 – we promise you’ll fall in love with them! Aruba is a tiny little island off the coast of Venezuela, and if you’re looking for an intimate destination for a small wedding, then this is the perfect place. 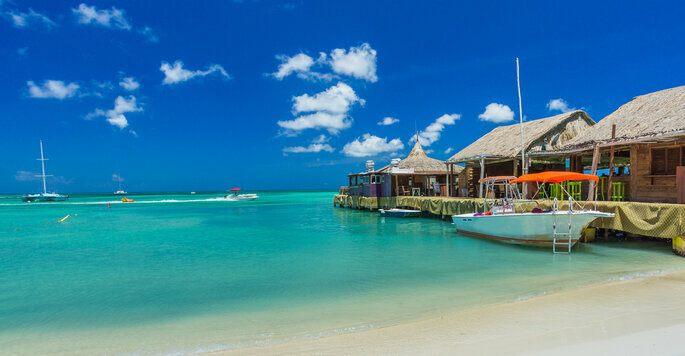 So adored by the Beach Boys, Aruba is the jewel of the Dutch Caribbean, you’re in for a few days of clear blue skies, cool crystal waters and enviable white-sand beaches that will make everyone at home jealous. The perfect backdrop for your wedding photos! 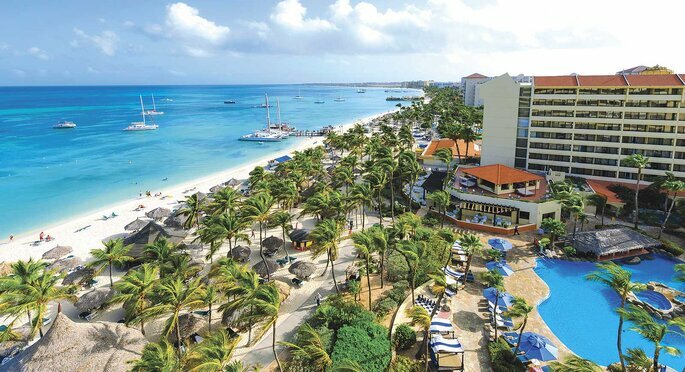 The Barceló Aruba Hotel offers 6 wedding packages with various price points depending on your budget – but all allow you to get married right on the beach. Whichever you choose, it is sure to be lavish and luxurious; with an on-site planner and team specifically dedicated to making sure your big day goes off without a hitch, you’re in good hands with the Barceló. Zanzibar is the capital of Tanzania, an East African country with some of the most spectacular coastal views in the world. 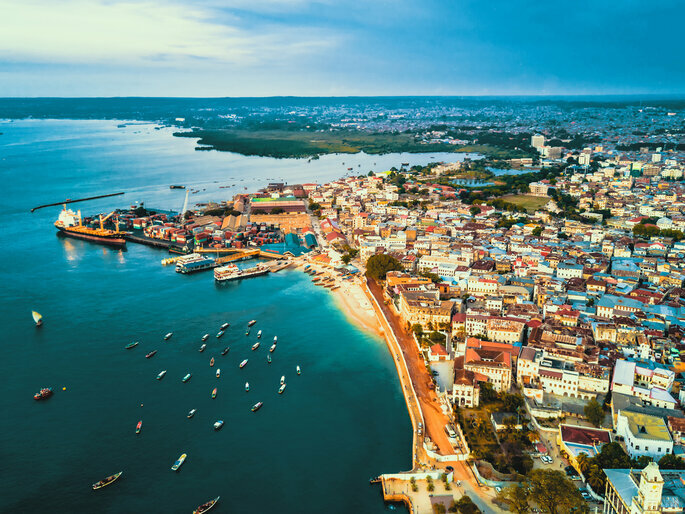 Known for its historic city centre – known as “Stone Town” – and for its rich natural resources (we’re talking the highest-quality spices here! ), Zanzibar is a fabulous option for your Destination Wedding abroad. 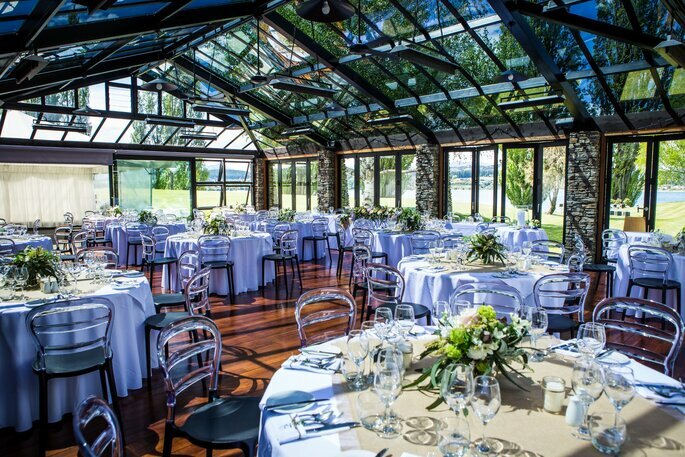 One of the less commonly frequented areas, your wedding here will be completely unique. And where better to get married on this beautiful African island than at a venue with a view that’ll knock your socks off! Getting married at one of the Zanzibar Collection’s four beachside properties will give you some unforgettable memories. For a minimalist and sophisticated ceremony, followed by a luxurious reception meal for two, this is the perfect place to elope to – or to bring a small handful of your nearest and dearest. Indonesia may seem a long way to travel for your Destination Wedding, but it would be worth every second and every penny spent planning. 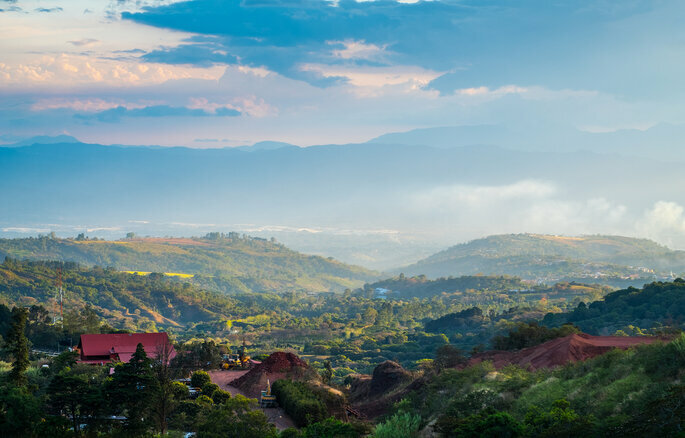 Probably the most beautiful country in the world – stunning natural features include tropical jungles, waterfalls and active volcanoes – this is the ideal place for adventurous couples who want to do something totally different for their big day. If you’re not too worried about the technicalities of your wedding (as in: is it legal! 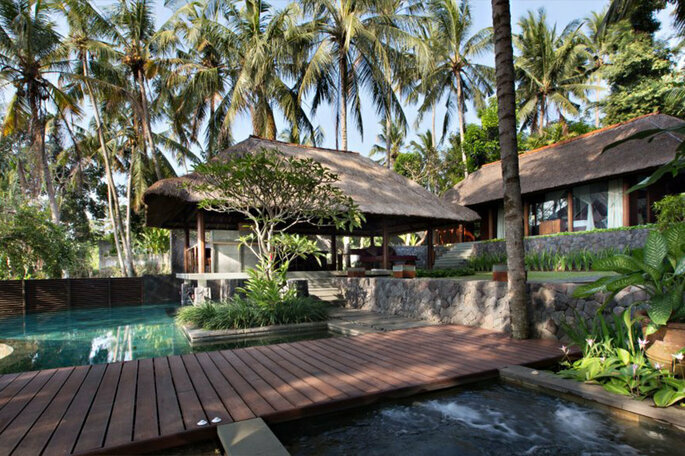 ), then you can “get married” pretty much anywhere in Bali – which gives you some truly spectacular options. 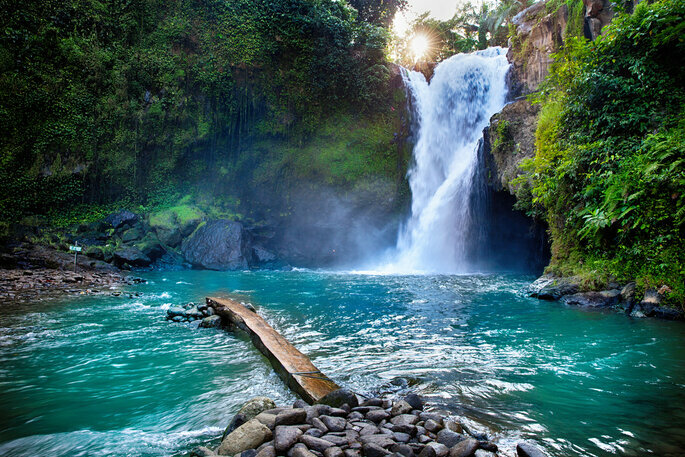 Why not have your “ceremony” at the foot of the infamous Sibolangit Waterfall? Or along the breathtaking Borneo coastline? However, if you want something official, then you should check out the Kayumanis Hotel in Bali: a discrete retreat for a personal wedding. Another country that may seem rather far, Mauritius is the perfect island destination for an intimate and casual wedding day. Far removed from the hustle and bustle of daily life, and the business of the city centres, Mauritius is a paradise just waiting for you to arrive. Spend the days before your wedding chilling along the beach with cocktails, and then have a simple ceremony in the sand. However, if you want something a little more up-market for your wedding, then staying at the Constance Prince Maurice Hotel & Spa will definitely float your boat… This award-winning venue has everything you could want for your big day – a planning team, a gorgeous room for your reception (with an in-house DJ to boot! ), and an entire spa at your disposal. Did someone say “massage with an ocean view”? 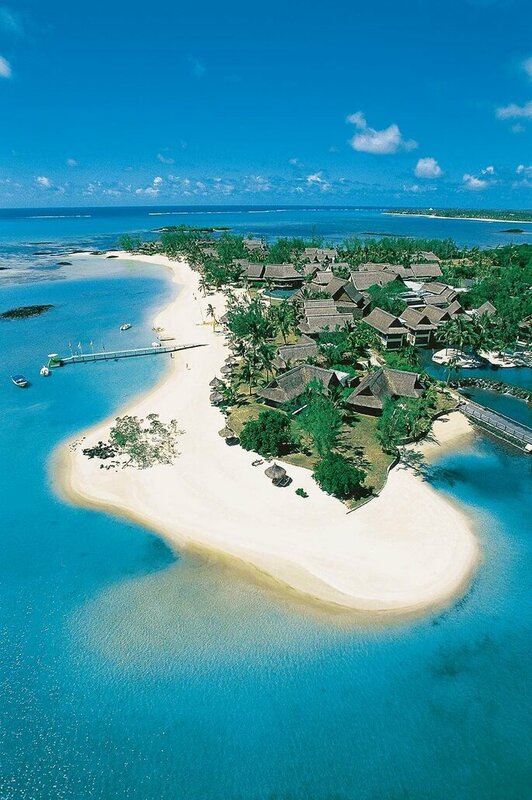 Discover the Constance Prince Maurice! Do we even need to explain the draw of Santorini, or is it obvious enough from the photos? Possibly the best Greek island (there are over 8,000 so we’re not wholly sure! ), Santorini’s infamous deep blue and stark white buildings have captured the hearts of newly-engaged couples for decades now. 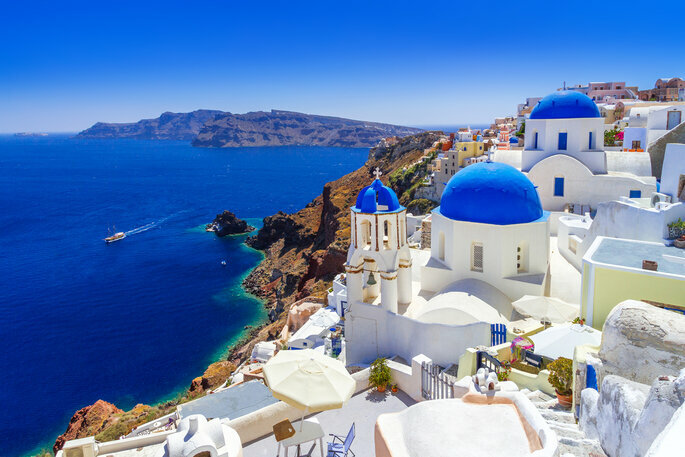 Easily accessed, and more affordable than some of the other options on this rundown, Santorini should always be on your list of destinations! Santorini is one of the most popular destinations in the world for weddings, and so your choice of photographer is incredibly extensive. It is more than likely that they will have been before, and so will know the best locations for a couples shoot, and will know how to balance the white background against your dress! Elianos Photography is one of these recommended photographers – one of the Top 10 in the UK, we would recommend you give him a try! Costa Rica’s “dry” season runs from December to April, so if you’re after a more affordable wedding (with guaranteed sunshine!) during the winter months, then this is the place for you! The epitome of exotic, Costa Rica is so far removed from life in the UK that you will feel as if you have landed on another planet. Get ready to enjoy a relaxed and tranquil wedding in this oasis of enjoyment. For a stunning wedding ceremony that you and your guests will never forget, take a look at the Hotel Villa Caletas. We’re going to be upfront with our reason why: it has a private beach. So if you’ve been dreaming of the perfect seaside wedding, and want to avoid tourists in the background, then you could not choose a better place. Alongside this, there is also an infinity pool, an award-winning restaurant service, and a serenity spa… So why not? 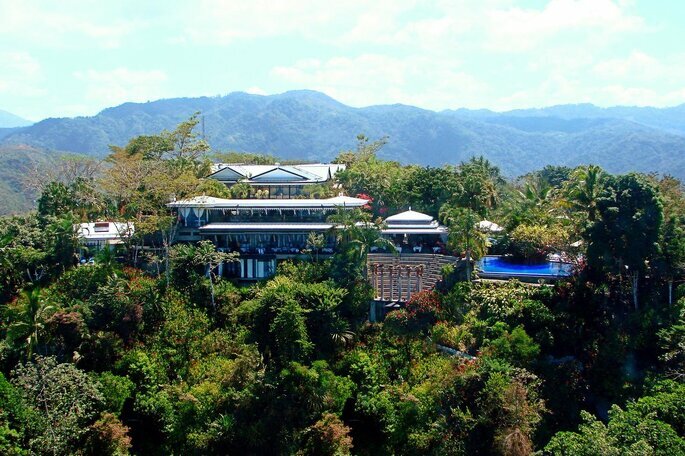 Discover the Hotel Villa Caletas! The Maldives feels like a place that only exists in Disney films. With sparkling sapphire lagoons that are too beautiful to be adequately described, and white sand beaches exactly like the ones you see on postcards, the Maldives is a paradisiacal location for your Destination Wedding. You’ll fall in love all over again, and once you have tied the knot, you’ll never want to leave! The Maldives is famous for its water villas, which are simply amazing. 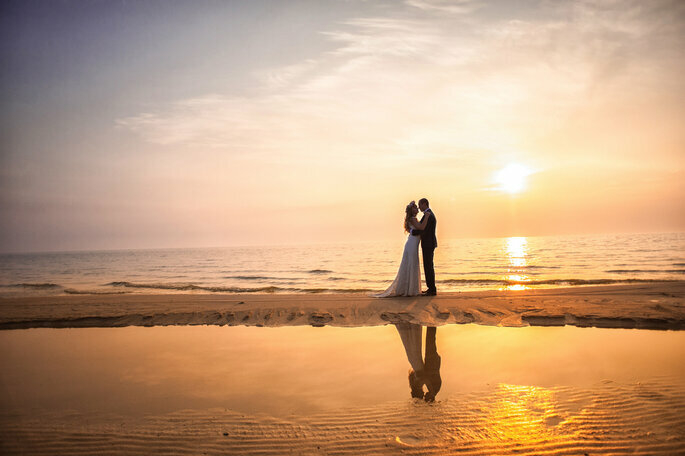 Enjoy your wedding night out on the water in a peaceful and serene location, and feel a deeper connection with nature; it’s a little different from getting married in your local church! 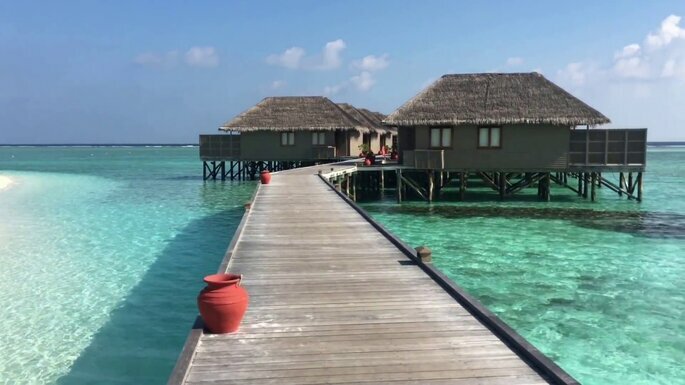 Here you can make the most unique memories – check out the Meeru Island Resort & Spa for the most luxurious water villas on the island! Discover the Meeru Island Resort and Spa! 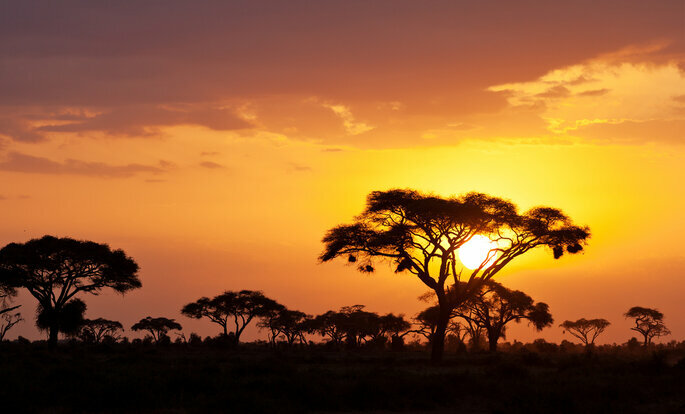 We head back to Africa to discover another awe-inspiring location for your Destination Wedding. Kenya is an incredibly popular honeymoon destination thanks to its amazing wildlife and compelling cuisine, but it serves just as well for your wedding itself. Kenya is hot all year around on the coast, so there’s no need to feel restricted by season when choosing your location. Immerse yourself in a completely distinctive culture and enjoy these incredible sunsets! 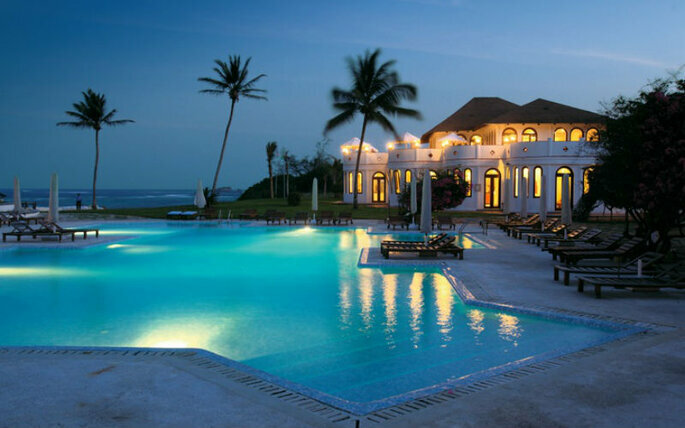 The Hemingways Watamu Hotel is one of – if not the most – luxurious hotels in all of Kenya. With ocean views that will make your jaw drop, and an in-house wedding service that will take care of every last detail for you, the Watamu is the ideal place to say your “I Do’s”. Have a personalised and special day at this amazing 5* venue, and then head off on a safari to celebrate! 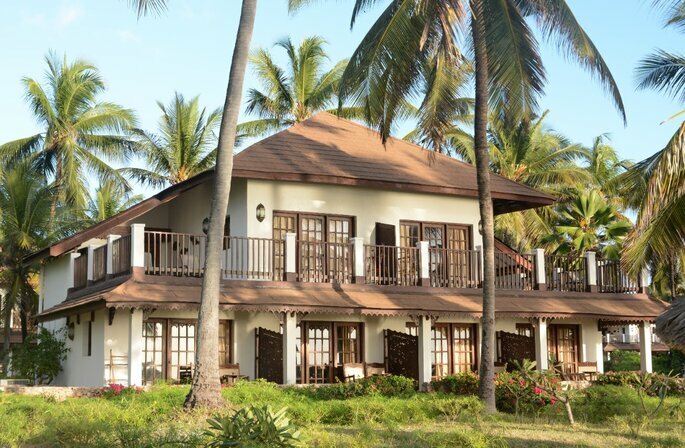 Discover the Hemingways Watamu Hotel! New Zealand is frequently chosen as one of the best places in the world to live – so it makes sense that it would be an incredible place to get married too! With stunning coastal venues, but equally fantastic mountain and lake locations too, you can choose from an overwhelming variety of outdoor spaces for a wedding that can never be surpassed. 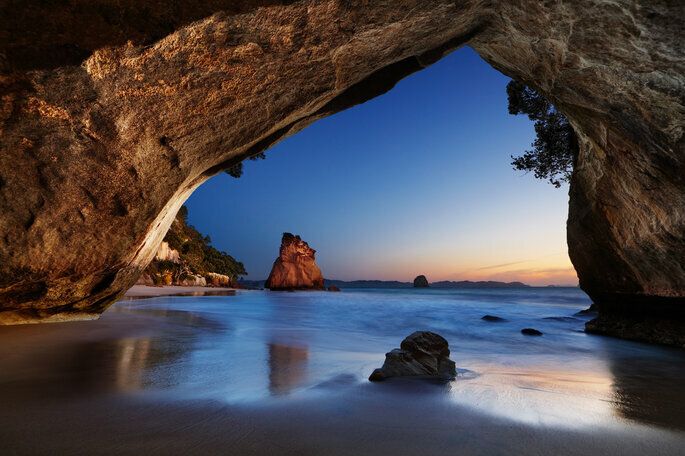 Take the plunge and take a risk – New Zealand may be a million miles away, but it will also give you a million memories that no other place ever could. And one of our favourite locations to get married in New Zealand has to be Wanaka. 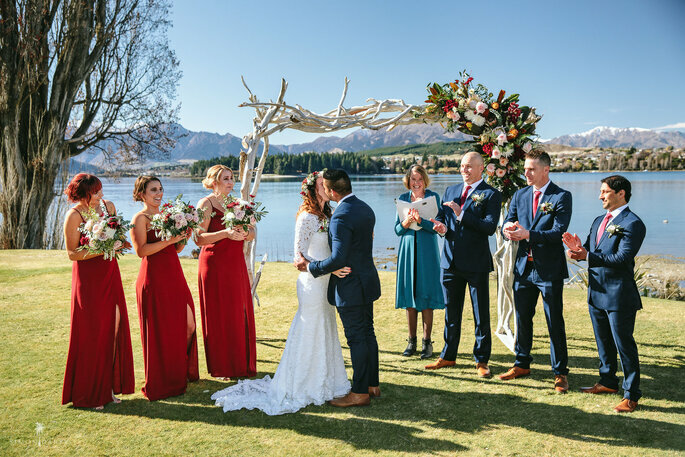 A gorgeous region of the country, which boasts the famous Wanaka Lake, your dream Destination Wedding could only be made better by planning it with the Edgewater Hotel. Well versed in organising ceremonies and receptions, and with insider knowledge on the best spots for you and your partner to exchange your vows, we highly recommend this venue! And finally, we go to the most classic Destination Wedding location of them all. 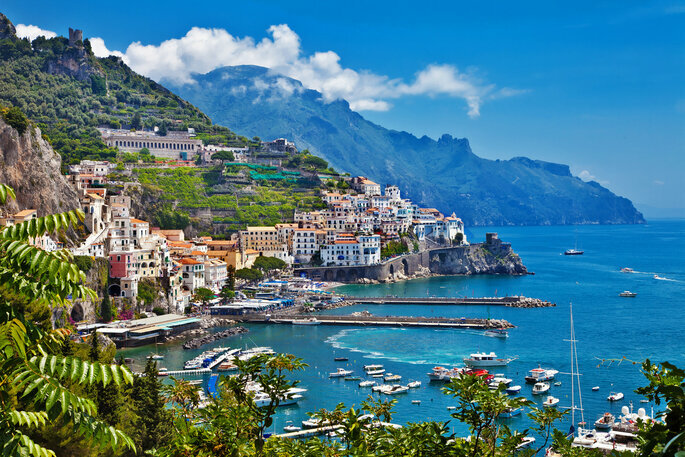 Not just in for 2019, but every year, the Amalfi Coast in Italy has been chosen by a variety of star-studded celebrities for their own nuptials – including George Clooney! – so why not join them? Replete with rustic venues for your perfect vintage or bohemian themed wedding, and with incredible cuisine for your reception, Italy has to be the place! The Amalfi Coast, alongside the aforementioned Santorini, is one of the most highly-desired locations for a Destination Wedding – and there is a veritable boatload of planners waiting for you there. 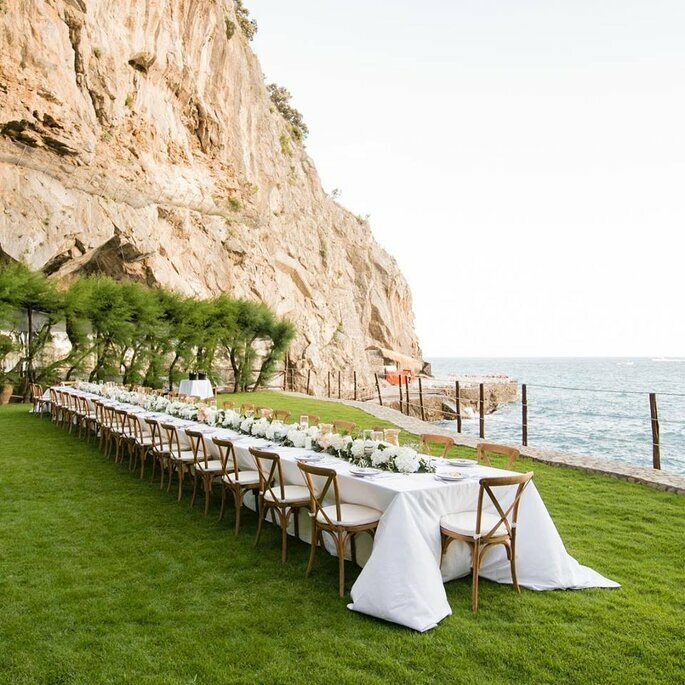 Local to the area, and with expertise in organising the most lavish ceremonies alongside on Italian coastline, La Calla is one of the best planners you could pick for your big day. Discover La Calla Wedding Planner! Organising a Destination Wedding is one of the most exciting things that you can do when you find “the one”. So choose one of these beautiful destinations to make your big day that much more romantic, and discover a whole new corner of the world as well!